At the close, the Sensex was down 157.89 points at 35876.22, while Nifty was down 47.70 points at 10746. About 1167 shares have advanced, 1344 shares declined, and 121 shares are unchanged. Ashok Leyland Q3 result: Net Profit falls 22% at Rs 380.8 crore, revenue down 12% at Rs 6,325 crore. HDIL Q3 result: Consolidated net profit at Rs 19.7 crore, revenue at Rs 222 crore, while EBITDA down 20% at Rs 97 crore. Results reaction: PNB Gilts shares rose more than 11 percent on Thursday after company posted net profit at Rs 93.3 crore in Q3FY19 against loss of Rs 36 crore, YoY. Prime Securities Q3: Consolidated net profit up 68% at Rs 5.8 crore against Rs 3.4 crore. 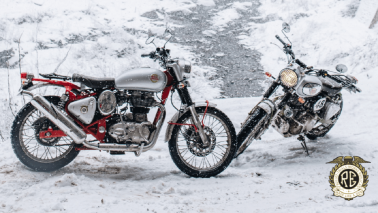 Revenue up 94% at Rs 135 crore versus Rs 7 crore, YoY. Rupee Update: The Indian rupee is trading lower by 23 paise at 71.03 per dollar versus previous close 70.80. 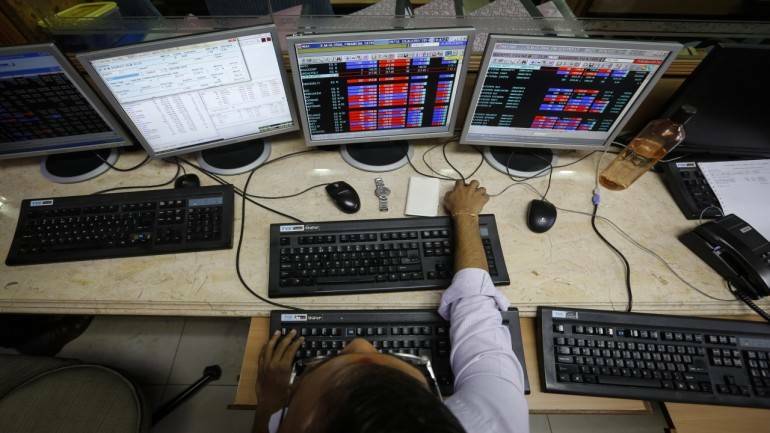 Why are Karur Vysya Bank's shares down over 16% in today's trade? 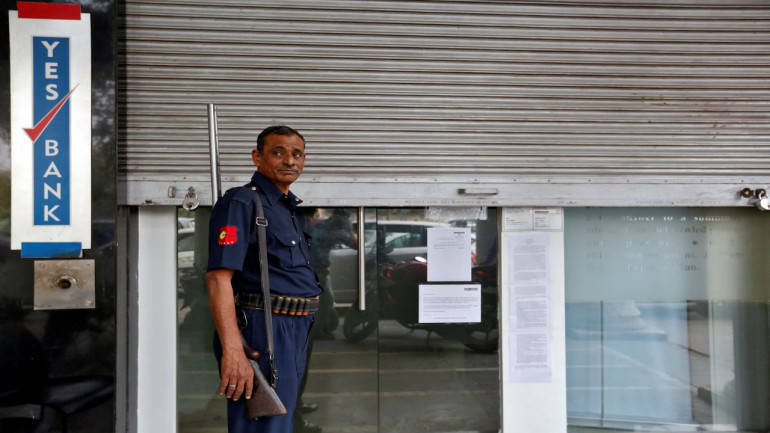 Karur Vysya Bank 's shares fell around 16 percent after seeing a positive start as investors turned wary of the guidance offered by the management. Market Update: Sensex is down 223.21 points or 0.62% at 35810.90, and the Nifty down 71.30 points or 0.66% at 10722.40. About 878 shares have advanced, 1408 shares declined, and 109 shares are unchanged. Larsen & Toubro lnfotech announced acquisition of Germany's Nielsen+Partner for EUR 28 million (approx Rs 224.15 crore). "The company, through its wholly-owned subsidiary, Larsen & Toubro lnfotech GmbH, Germany, has signed a definitive agreement to acquire Nielsen+Partner Unternehmensberater GmbH headquartered in Hamburg, Germany, along with its identified subsidiaries in Luxembourg, Switzerland, Thailand, Singapore and Australia and branch office in Belgium," Larsen & Toubro lnfotech said in a regulatory filing. Rupee Update: The rupee has been volatile in day's trade and is currently trading lower at 70.88 per US dollar, down 0.11 percent. Buzzing: Va Tech Wabag is up 3.7% on order win worth Rs 520 crore under Namami Gange. Mukta Arts Limited has concluded a deal with Tips Industries Limited for extension of all audio and music video rights for a royalty of Rs 9.63 crore, the company said in a BSE filing. Coffee Day Enterprises said the Income Tax Department has released 74.90 lakh attached shares of IT firm Mindtree, owned by the company and its promoter V G Siddhartha, but attached Siddhartha's 46.01 lakh shares in Coffee Day Enterprises over potential tax demand. Wholesale prices in India has eased to 2.76 percent in January, as compared to 3.80 percent in December, due to cheaper food and fuel prices, data released by the commerce and industry ministry showed. Wholesale inflation, measured by the Wholesale Price Index (WPI), grew 3.02 percent in January 2018. The WPI is a marker for price movements in bulk buys for traders and broadly mirrors trends in shop-end prices. As benchmark indices continue to trade in a range, India VIX, the measure of volatility, is trading almost flat. It is trading at 15.73, registering a marginal increase of 0.04%. 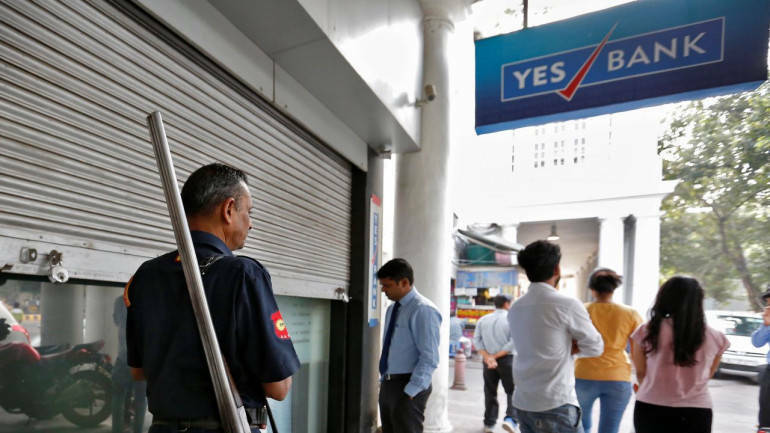 Yes Bank rallied as much as 30 percent, the highest intraday bounce seen in the stock since July 2005, after the company announced no divergence on the asset classification and provisioning for FY18. 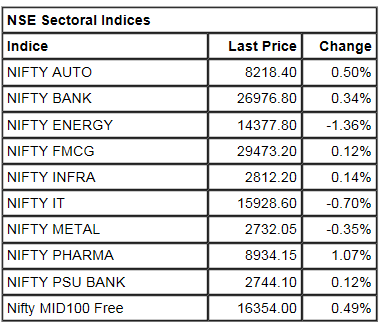 Nifty Metal index is trading about 2% down. All constituent stocks are trading in the red. 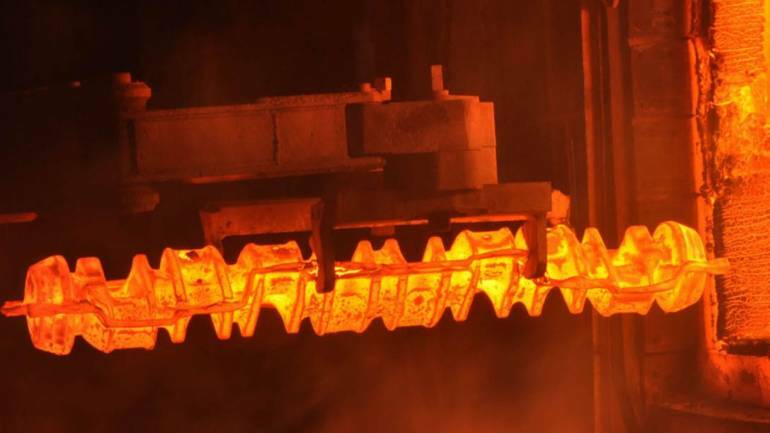 National Aluminium is the biggest loser, down 6%. Market Update: Sensex is down 106.37 points or 0.30% at 35927.74, and the Nifty down 44.00 points or 0.41% at 10749.70. About 791 shares have advanced, 1,180 shares declined, and 84 shares are unchanged. Yes Bank is up about 21%, much below its day's high. Other gainers are Hero Motocorp (2.7%) and Indiabulls Housing (4%). 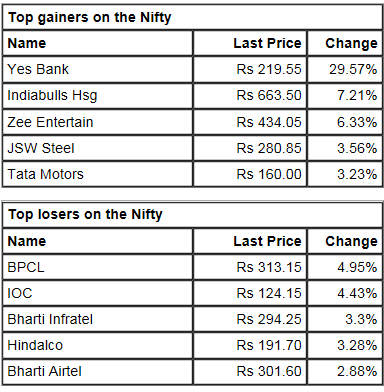 HPCL (4.5%), Indian Oil (3.7%) and Bharti Airtel (3.3%) are the biggest index losers. Buzzing: Share price of Bosch rose 3 percent after company reported better numbers for the quarter ended December 2018. The company's third quarter profit grew by 19.3 percent year-on-year to Rs 335.4 crore. "As part of this process, Yes Bank has received the risk assessment Report for 2017-2018. The report observes NIL divergences in the bank's asset classification and provisioning from the RBI norms," the bank said. L&T wins order: The construction arm of L&T has won orders across its power transmission & distribution (PT&D) business and water & effluent treatment business. Market Opens: Benchmark indices are trading lower on the Thursday morning with Nifty hovering around 10,750 level. At 09:18 hrs IST, the Sensex is down 52.52 points at 35981.59, while Nifty is down 26.20 points at 10767.50. About 304 shares have advanced, 495 shares declined, and 30 shares are unchanged. 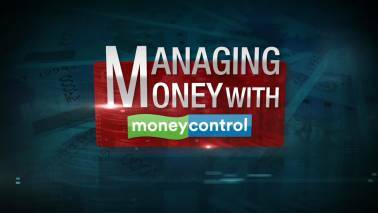 Karur Vysya Bank, IOC, BPCL, HPCL, Reliance Capital, Repco Home Finance, DHFL, RIL, Kotak Mahindra Bank are among major losers, while Yes Bank is up 27 percent, while Tata Motors, L&T are other major gainers. Rupee Opens: The Indian rupee opened lower at 70.87 per dollar on Thursday versus previous close 70.80.